The NEW CD150 Dispenser is a high volume dispenser designed for dispensing lower viscosity materials such as primers or sealers used in deck overlays. 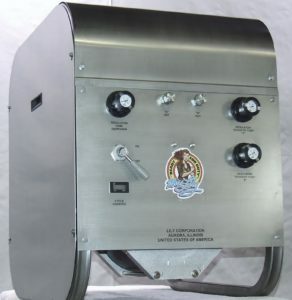 It can also be used as a smaller alternative to the Lily Corporation CD250 dispenser for bridge deck epoxy overlays. The new CD150 Dispenser is a pneumatically operated, high output dispenser. Dispense rates of up to 250 gallons per hour or more are obtainable. The CD150 utilizes a self monitoring system to assure metering accuracy. Viscosity differences between resin components due to chemistry or temperature will not affect the dispenser’s ability to maintain ratio. There is no need to monitor flow rates or adjust pressures. Clean-up is limited to the disposal of the static mixer. The CD150 can be supplied from 55 gallon drums or totes. Give us a call. Let our experience help solve your epoxy dispensing needs.